The New Art Gallery Walsall in the heart of Walsall town centre. Reuben Henry and Karin Kihlberg have turned the artists' studio into a fully operational film set in the shape of an institutional waiting room. Gallery visitors are invited to star in a series of short videos. Email to take part. ..... more ! Family groups from four different communities in Walsall use the diverse cultural artworks in the Garman Ryan Collection as a source of inspiration for creating art works ..... more ! 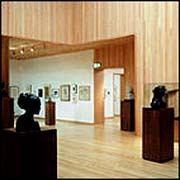 Folk Archive is an ongoing collection of contemporary folk and vernacular art from Britain and Ireland ..... more ! Doppelgänger is a full colour, stereoscopic, dance-screen installation comprising four projections, directed and choreographed by Liz Aggiss and Billy Cowie. Kerry James Marshall's first solo show in the UK presents collages, large scale paintings, drawings and prints from the 1970s to the present day. ..... more !